Yes, you read that right. Today, I have invited a self-published author who has achieved a feat. In March, she was outlining her first book, and at the end of May, she had sold over 12,000 copies, reaching No. 11 in the Kindle bestsellers list. The paid one. Are you okay? Need a glass of water? I’ll wait. 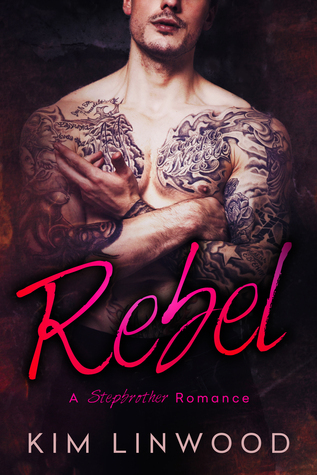 Rebel is a stepbrother romance—the scorching hot trend right now. Still, 9 out of 10 bestselling authors of that sub-genre have a long backlist of books and a strong author platform (trust me, I checked). Today, I brought to you the other … one. When I checked out Rebel by Kim Linwood and saw that she’s a first-time author just starting her author platform, I had to connect with her. Kim is very sweet and approachable, and it turns out that this is her first interview! Well, we’ll take advantage of that now, won’t we? 😉 Read on for probably the most interesting interview you’ve read in a while. Kim, I can’t begin to describe how excited I am to get to know you better. Your success is every indie author’s dream, and tapping into your approach to self-publishing is an opportunity not to be missed. Before we get down to talking shop, what else can we know about you? I’ve always loved reading and writing, even though for most of my life I haven’t worked with it explicitly. I love to read widely, and while I think writing bad boy romance is a ton of fun, I’d love to make some forays into other genres at some point, like science fiction or horror. I might have a bit too much fun with my writing for good horror, though. 😉 I’m lucky enough that I’ve been able to make the leap to try to make this my full time job. I’m blissfully married, and have two healthy, talented and bright grade-school age boys who keep me busy when I’m not writing. There’s always something to do! Rebel is your first full-length novel. Did you have any prior publishing experience? I’ve written a bunch of short stories, with the goal of honing my craft and learning the publishing process. It’s given me practice in making engaging covers and blurbs, and understanding how to get the process running. It’s also taught me a bit about what I need to outsource. Launching Rebel was a lot of firsts for me, though. First full-length, first paperback (lots of special formatting), first attempts at larger scale promotion and advertising, first ARC team, and so on. It was a lot of new things to learn. Stepbrother romances are the hot trend right now, but it might not be so in six months, which makes me wonder. Did you set out to jump on that particular bandwagon? When you were testing waters with your short stories, was Rebel already written or conceptualized? Until I was ready to start writing the novel, I really didn’t know that I’d write a stepbrother book, but I really enjoy bad boys and sassy girls, and love the love/hate dynamic between them, so it seemed like a natural choice. I wanted to create a story with sparks flying everywhere, hopefully with a couple of fun surprises and with a satisfying Happily Ever After ending. Within that framework, I looked at the Amazon top 10 to see what was selling. I really want to make writing my full-time business, and so there is a balance between finding your stories and writing what sells. I’m lucky enough that I discovered a trend that I found really entertaining and that engaged me, so after reading some of the top books at the time for inspiration, like Prick by Sabrina Paige or Blackbird by Abigail Graham, I set to putting together my own bad boy stepbrother story. I had a ton of fun building the plot and writing the characters of Gavin and Angie, and I hope that shows in the final book. Most definitely. I read Rebel in almost one sitting. (You can read an excerpt here and my review here.) Confession time: I read the book because I had to establish that it’s quality work before inviting Kim over. Indeed, it is very professional in every aspect. What stands out is the great editing—the weak spot of many new self-published authors. What aspects of Rebel did you outsource to professionals? I’m very lucky in that I’m close with a fantastic editor who looks at everything from typos and simple proofreading to plot inconsistencies, logic, character consistency and flow. We have a process that puts the book through several iterations, to hopefully achieve a great final product. I’ll give an example of our process here. First I self-edit the book, doing what I can to get rid of awkward phrasing, inconsistencies, slow points, and anything at all that I’m not happy with. While I write, I’ll usually leave comments to myself for editing as I think of them, so I address all of those as well. Then my editor reads through the book quickly, like a reader, and then gives me big picture feedback. The book’s slow here, or a guy like Gavin would never do something like this, or whatever. I fix those if I agree, then pass it back for a more in-depth pass. This is where it’s important to be humble, because my editor is merciless. Whole passages are cut, rewritten, adjusted and added, all in the name of making a better book. Once I’ve responded to those edits, there’s a final read-over to make sure nothing got broken in the edit process. Finally, I send the book out to a handful of beta readers who read the book and give their own feedback. Once I’ve responded to those, the book is ready for ARCs and publishing. What about the cover? The cheeky “what” gesture of the guy makes it stand out from the mass of almost identical covers. Who gets the credit? I commissioned the cover from Cormar Covers. I do alright with Photoshop, but not making a cover for a bestseller alright. 😉 The image is stock, but she’s really good at taking a basic stock photo and making it look unique. The credit for the cover is all with my cover designer. About a month and a half. It took a couple of days of outlining, about three weeks to get the actual text written, and then a couple of weeks of editing, including betas. Finally the ARC readers got the book a little early, and then the book went live soon after that. Three weeks to write a full-length novel? (Rebel is at 61K words.) To most of us, this timeframe is, well, unrealistic. Especially if you include working with an editor. Can you get more specific about how you managed that? April was easily my most productive month ever, at right around 70,000 words, and May was nowhere near it. Sometimes the words flow quickly and other times there’s too much going on or I’m just not inspired enough. That said (and it was probably a couple more days than three weeks), that’s still a little less than 3,000 words a day on average. It’s fairly quick, but far from superhuman if you put the hours in. I do have an online circle of author friends and we track our word counts on a shared spreadsheet. A few of them routinely put out 100-150,000 words per month. I feel very much in the middle of the pack there. I think Stephen King’s writing advice is to write at least 2000 words a day, and I try to stick to that when I can. My editor and I are very close, and she isn’t on the market so I get to monopolize her time. I do all my writing in Google Docs, and then I just share the document with her, giving her commenting rights. I split the book into smaller parts, so as soon as she was done with a part, I could jump on that one while she started the next. That gave us a very quick rapport while going through the edit process as a team. I was making corrections almost as quickly as she made comments and suggestions. For actual writing productivity, I use the Pomodoro Technique, which is using focused time boxes of work. Basically, I start a timer and concentrate on writing for 30 minutes, then a 5-10 minute break, and then back in. It’s a very nice way of keeping focus, since I won’t allow myself to check email, Facebook, etc. while the timer is running. I can usually produce about 4-600 words in a 30 minute sprint, so getting to 2-3000 words in a day is only 3-4 hours of writing. My best day was around 7500 words while I was writing Rebel. That is amazing. I’m linking to the Pomodoro Windows app, in case anyone (everyone) is interested. You’re truly dedicated. And what does that incredibly productive workspace of yours look like? 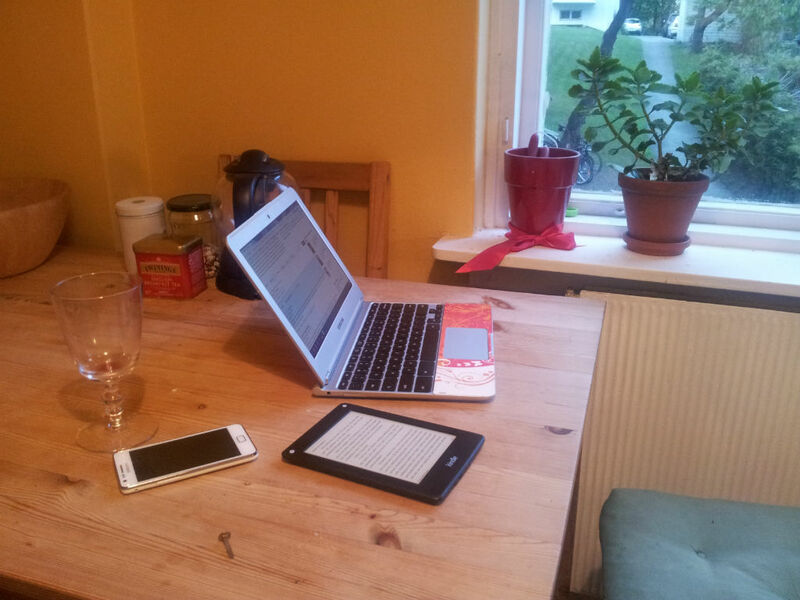 We live in a fairly small apartment, so I don’t have a dedicated writing space. Instead I’ll carry my Chromebook with me (my writing tool of choice) and rotate between the living room couches, the bedroom or the kitchen. Sometimes I go out to write, at a café, for example. I included a shot from our kitchen for your work space collection. Now your workspace picture is pinned on my Featured Writers’ Workspace board on Pinterest. Having prepared a highly professional manuscript that draws on a hot trend, how come you didn’t submit it to an agent? Would you consider traditional publishing? I thought about it, and I’ve spoken with several authors about it, some of whom are fully or partially traditionally published. In the end, publishers seem too slow and cumbersome, at least for now. Hot trends like the stepbrother one come and go quickly enough that by the time a traditional publisher is ready to publish your book, the trend has passed. They work with horizons of months to years, while I work with a horizon of a few months, if not weeks. How many traditionally published stepbrother romances do you see out there? So in the end, I was too eager to get my work out there, and confident enough in my abilities to pull the self-publishing off that I decided to rule out traditional publishers for now. I may revisit that at a later time when I have a more established catalog and hopefully a more attractive potential author for a publishing house, but right now I’m just eager to get my next novel written and released to the world. I’m having way too much fun! You have found the perfect recipe for fun and profit, Kim. Good for you! You have undoubtedly worked very hard on your first book, but not as much on creating an author platform prior to publishing. In fact, it seems that you’ve launched both the book and your platform at about the same time. How did you market Rebel? I launched my Facebook presence a couple of weeks before the book launched and mostly promoted there. I made posts, connected with other authors, and some of them were nice enough to share my cover and blurb reveals. I tried to engage potential readers where I found them, but I’ll be the first to admit that I’m not any sort of social media expert. However, I do feel like I had a solid book with a catchy hook and a great cover, and I think that helped build a lot of interest. Once the book launched, I submitted it to tons of free promotion sites and review blogs, and I’ve run ads on Facebook and some paid promotions, like My Romance Reads, for example. Those definitely help spark interest. At this point, I have to congratulate you on your blurb. From where I stand—an avid romance reader who knows trends and has read all sub-genres—I think that readers looking for a new stepbrother romance need only read the first line (“I married my stepbrother”) to one-click Rebel. That was wickedly clever! Giving out something absurdly illicit yet tempting. Apart from the enticing blurb, what else do you attribute Rebel’s huge success to? Thank you! I worked hard to come up with a blurb that was catchy. I spent nearly a week on the blurb alone, refining it and getting feedback from other authors and readers. Presentation is so important to get someone to click the buy button. I know it is for me, at least, so I made sure both the blurb and the cover were well done. Anything you would have done differently? A faux pas you don’t intend to repeat? By the way, thank you for offering an ebook to one lucky reader. Guys, leave a comment, and one of you will get to read the super successful Rebel. So what’s next? For now, I’m intending to stick with the stepbrother theme. I had so much fun writing the first one, and I’ve gotten a new idea that I think will be perfect for it, with lots of opportunities for sass, crazy hijinks and hopefully a compelling love story in the end. I’m in the outlining phase now, figuring out how to put it together, and then I will start writing as quickly as my fingers and brain will let me! Kim, I can’t thank you enough for giving us valuable insight into your success. Many might think you were lucky. To me, luck is preparation meeting opportunity (actually Seneca said that, not me 😉) and in that aspect, you are truly golden. Best of luck with your future projects. Thank you so much, and thank you for the chat. I really enjoyed it! Well, how about that, ladies and gents? Was Kim’s process shocking? Not so much? Is there an aspect that intrigued you? Kim’s success comes as a backup to my growing conviction that newbie writers like me not only overwrite (guilty) but also overdo everything. But that’s material for another post. Again, if you want a taste of Rebel, here’s an excerpt, and here’s my review. Also, leave a comment for a chance to win a copy of the book. Blimey I’m in awe. I’m not sure how old ‘grade school’ is but I have one kid age 7 and there’s no way I could produce a book in under a year. I’m dead impressed. I like the timer idea, I hadn’t thought of trying that. It’s very easy to sit down at the computer and get distracted, or so flustered by the amount of stuff you need to do that you never settle on anything. I’ve started writing lists, which helps, but I will definitely be trying the timer message… Probably with the pinger from the kitchen rather than the app though! Phnark. Thanks for posting and good luck Kim, – although it sounds as if you made a lot of your good luck! I also agree that while luck can play a part you also make your own by having everything tip top quality and there when the opportunity comes. Based on “blimey” you must be in the UK, so “grade school” would be primary school in your neck of the woods. Yes, with a 7-year-old you do know what’s like. My daughter is 5, and I’m your kind of person. Kim is either a superwoman or super organized. Definitely not a procrastinator … like me. Thanks for taking the time to comment, MT! A pleasure, thanks for putting me right about grade school, I am, indeed in the UK. Thank you! 🙂 My boys are 8 and 11, so old enough that they can take care of themselves mostly during the day when they’re not in school. The biggest challenge is really getting work done when they have friends over, since we live in an apartment without that many places to be. 😉 They’re good kids who don’t cause a lot of trouble, so I definitely lucked out there. And I meant timer method but naturally Apple’s warped, evil auto correct turned it to something non sense all without my noticing. Oh, it’s been known to do far worse than turning “method” to “message” 🙂 No problem at all.